Wearing Tags & Taking Names - Agri-Trade 2018 - Agfinity Inc.
Nelson and I went on a road trip to Agri-Trade in Red Deer. or 9th time going to Agri-Trade in 11 years. For me, the show symbolizes the end of harvest and the beginning of winter. For a brokerage company, I see it as the opening ceremonies for this coming trading year, not to mention, the beginning of many trade shows and conferences throughout the winter. I’ve always enjoyed my time at the show. 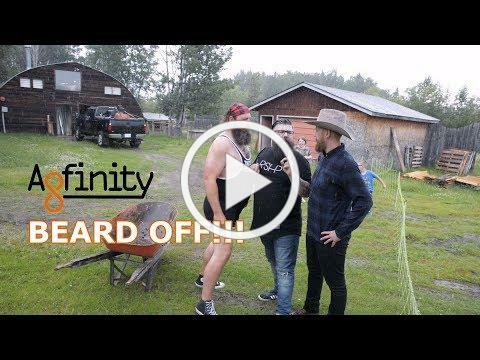 Nelson Neumann started with Agfinity 9 months ago, in March of this year, and this was his first business trip and his first time going to an agricultural trade show. He was excited. One of the challenges with the Red Deer Agri-Trade is that it’s a trade show. Other than a select few people, no one has a name tag, making connecting with people quite challenging. Most of our interactions have been on the phone and you may know what we look like because of social media and other pictures we plaster over the newsletter, but we don’t always know what you look like! One of the ways Nelson and I rectified that challenge was printing nametags and it worked like a charm! Like I mentioned previously, I’ve been going to this show for the past 11 years. Not half as long as some of you, but I remember the first few times I walked by the tractors and Bob’s Sucker-Rod Fence-Post booth not really knowing any of the people walking by… Sometimes I brought someone with me and other years I went alone. It’s a big show and can be a lonely, busy place if you don’t put yourself out there. One of the statements we say to our traders in the office and my kids is “you get what you give.” If you want to have a rich experience, you need to put yourself out there. No doubt the nametags help, but these last couple years have felt like we were going to hang out with old friends. Nelson and I didn’t get too far without bumping into another farmer or buyer we know. It caused a laugh because it looked like we put a booth right in front of the lady’s washroom or in front of a few garbage cans because we were standing there for so long. Even commandeering pieces of other peoples boots to catch up with friends! Many of you were brave enough to come up to us and say hi. We truly appreciated it! Nelson texting you back from the floors of Agri-Trade 2018. Nelson had a great time and was able to experience Agri-Trade in a unique way, not needing to walk around hoping to bump into someone he knew but being able to connect with many people because Jared and I have walked those booths many years before and will continue to moving forward. Many times, the conversation leads to where do we see this industry going in relation to the grain trade and markets. With huge companies coming into play and data being the holy grail of the future, I think you know what I’m going to say. The future is relationships and how deep we can grow them. There is a reason why trade shows and conferences have been gaining in popularity over the years. That is because we still crave and desire to shake hands and meet in person, to put the proverbial face to the name. Because Farming is Forever. So we’ll be catching up eventually!